They then pointed out the visitation ban of two political prisoners Golrokh Iraee and Arash Sadeghi and that they have been uninformed about each other for 10 months. Yasamin Aryani and Saba Kord Afshari also noted that women political prisoners had to go on a hunger strike for access to dental care after a year of follow-up. In the end, they pointed out the shortage of food distribution, which has had a harmful effect on the female political prisoners. Saba Kord Afshari and Yasamin Aryani were among five young women who have been sentenced to spend time in prison for participating in protests last August. 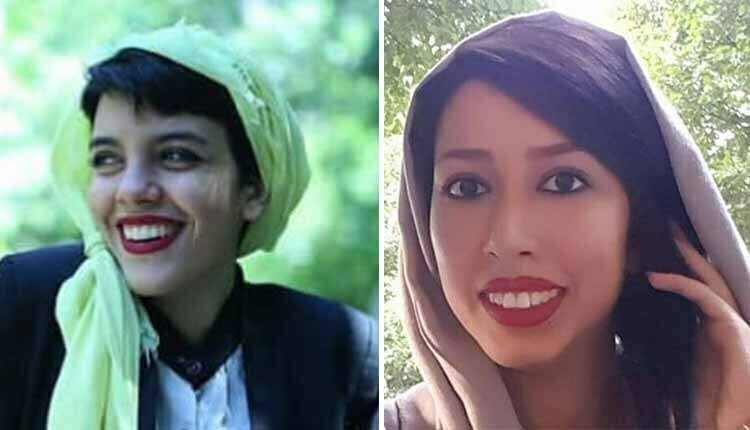 Yasaman Aryani and Saba Kord Afshari are sentenced to one year. Reports, at the time indicated that Yasaman Aryani, 23, was arrested after helping an old woman who was thrown to the ground by anti-riot units. Right after their arrest, the young detainees posted a message on their experience and calling for help via a cellphone from inside a State Security Force van as they were being taken to jail. Thousands of enraged protesters poured into the streets of several Iranian cities for several days in early August 2018, protesting the country’s faltering economy, skyrocketing inflation, hardship and hiking prices. The protesters soon openly chanted against the regime’s Supreme Leader, Ali Khamenei and other clergy who have been ruling Iran for four decades. Reportedly, dozens of protesters were placed behind bars in Evin and fifty female detainees in Qarchak prison, which is described as the largest prison for women in Iran. The state-run media describe the situation of political prisoners as “favorable” while numerous reports prove that inmates, particularly political prisoners and prisoners of conscience are routinly subjected to harrasment and illtreatment in prisons. Recently, a prisoner has written about atrocious conditions in Evin prison, which is notable as the primary site for the housing of Iran’s political prisoners. “The wards of Evin Prison are packed with inmates, far higher than the capacity. Twenty to twenty-five inmates are held in one room, most of whom sleep on the floor. The food is very poor in quality. They use soya in the food that is specially made for livestock. The food literally cannot be eaten. There is no sign of vegetables or any protein-rich foods. The inmates are served half-cooked rice and soya on a daily basis. “The store sells some food stuffs at very low quality, in very limited quantities at skyrocketing prices. These items are at least 20 percent more expensive than ordinary items sold outside of the prison. The store provides fruits once every 20 days at very low quantity and extremely high prices. “According to the prison’s rules and regulations, one loaf of bread should be provided with meal. However, these days each inmate receives only one and half loaf of bread for the entire day and it is very low in quality. The inmates are told they have to purchase more bread if they wish. They are even demanding the prisoners pay for hygiene goods such as trash bags. “Each inmate must receive one razor, some tide, shampoo and a small towel, toothpaste and a toothbrush. In the past four months, they have no longer provided toothpastes, toothbrushes or towels. Other hygiene necessities have been cut in half and shampoo is only provided once every two months. “Inmates must pay huge amounts of money to call their family members and such services are not provided by the prison. “In ward 8, where 800 inmates are held, there are 40 phones that are open only 12 hours a day. Each prisoner is officially permitted to have a call lasting for only half an hour. However, one third of this time is eaten up to enter the various codes needed to open the necessary lines. Having being condemned 65 times by the United Nations for its hideous human rights violations, the Iranian regime cares nothing about the inmates’ rights. That is why each prison is turned into business opportunities for the regime officials, let alone the torture and executions taking place in such dungeons.